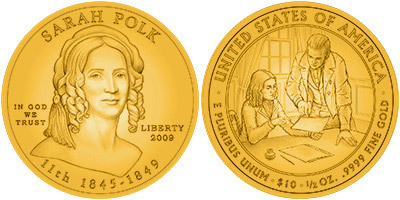 The Sarah Polk First Spouse Gold Coin will be released during 2009 as the twelfth release of the First Spouse Gold Coin Program. During 2009 a total of five different coins will be issued for the series. The release date for the Sarah Polk First Spouse Gold Coin is scheduled for fall 2009.